Let’s face it – we all enjoy a little bit of R&R from time to time. There are a lot of possibilities when it comes to spending your vacations, holidays and weekends, but in the warm season, the majority of people tend to “migrate” to the beach. The warm sun and hot sand, the cool breeze and calming waves, it’s all great. What’s not great is getting sand all over yourself and your belongings and getting sunburns. While there are a lot of solutions to remedy these issues, there’s one that takes care of all of them – an elegant, portable beach canopy. If you’re not familiar, a canopy is a tent that gives you protection from wind, sand, and sun rays, a great purchase for people who want to considerably bump their comfort levels. How many people do you want it to fit? Size will be one of the factors that should influence your decision. Windows and pockets. As they’re all pretty basic concepts, some products will offer more utility with pockets for storage and windows that will give you better airflow and allow the temperatures to stay cool. Value. 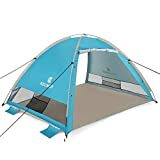 Last of all, the value that the tent brings to the table is probably the biggest factor that you should be considering before making a decision on what to purchase, because of how similar each product is to the previous. 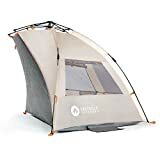 We’ll be kicking off the review with the Pacific Breeze Easy Up, a pop-up beach shelter that has the great title of being Amazon’s top choice for this line of products. The EasyUp Hub System used in designing this particular popup beach tent gives users an effortless installing experience. Just choose a place, set up the frames (which are made out of durable and lightweight fiberglass), pull the strings and the whole tent will be set in a matter of seconds. Size-wise, it’s not that big – we recommend this to be used by individuals or couples. With 87″ L x 47″ H x 49″ D dimensions, it does provide enough space for up to two adults, but no more than that (unless you want to sacrifice quite a bit of comfort). It has two windows that come with foldable covers, a carry bag, and four stakes to anchor it. The materials used offer UPF 50+ protection and are windproof and waterproof. When packed, it weighs a mere 4.45 lbs. It’s very affordable, although it’s not the cheapest. You’ll see that, compared to the other products we’re about to feature, it’s a bit more expensive, although this one comes with a 1-year warranty. That being said, this is a heck of a pop-up beach shelter. Yes, this is almost the same product as before. It’s the Deluxe XL version of the Pacific Breeze Easy Up beach tent. 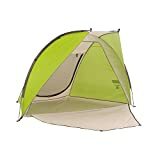 Another great pick for our best beach tent for family choices, this XL version can comfortably fit up to four people while still being very compact and lightweight. The same features can be found on this model – UPF 50+ screen protection, windproof and waterproof fabrics and the awesome EasyUp installing system, which allows you to set it up in less than one minute. The price is a bit higher, but that’s to be expected since it offers a lot more space (95″ L x 52″ H x 51″ D) and trust us, it’s well worth the money. You can even fit two beach chairs inside. Coleman is known in the outdoor industry for the quality of their products and how well they measure up to the manufacturer’s specifications in real life tests. This little pop-up beach shade provides users with plenty of sun protection because of its low-angle design. The only issue is that, because it lacks any type of side windows, you’ll find it hard to keep it safely in place if you’re facing some heavy, forwards winds. Consider buying some larger sandbags than the ones that come with this particular shade. It’s big enough to fit two more adults (57” high), but no more than that, and you can’t add beach chairs or anything else. Weighing only 5 pounds, we recommend you use this if traveling light is an issue for you, as it’s very small when compact. It’s also made using fiberglass (frame) and it’s and windproof. Cheaper than our top two pics, this is a really nice alternative for people who just want a place to sit out of the sun. This also comes with a one year warranty – a really great beach shade canopy. The SEMOO Lightweight is another great choice for our best beach tent list, although just because it’s dirt cheap. When researching the sun shelter beach-related products, we’ve come across this little guy, which is a great choice if you’re looking for a little sun and wind protection and you’re on a budget. While it’s not the best canopy for windy conditions, mostly because it’s almost impossible to set up in strong winds, it still offers UPF 50+ protection. What’s the biggest issue with the SEMOO lightweight is the fact that it can’t comfortably fit two full-sized adults, which is a big letdown. Let’s take a look at the G4Free beach cabana tent, a large popup beach tent that can fit up to 4 adults. 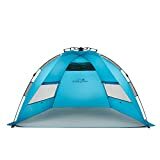 We’ll start by saying that this is probably the best beach tent for family use on our list, as it offers plenty of space (86.6″ x 74.8″ x 51.18″) and storage options for a very, very fair price, bringing a lot of value to the table. The materials are of high quality, being made out of waterproof polyester, sheltering you and your loved ones from wind, sun, and winds. It also has two windows and two openings, so strong winds won’t be that much of an issue. As a popup beach canopy/tent, you can set it up in seconds, much like our top two picks. The iCorer Automatic Pop Up has made our best beach shade canopy list because of how much use it provides for parents. This small sun shelter is great if you’re traveling with your child/children, as its very easy to set up and offers plenty of sun protection (UPF 50+). For adults, it’s a bit small. It can fit just one full-sized person with some room left for your belongings. Weighing only 2.2 pounds, it will make a nice additional pop up beach shade. While it’s not the best beach canopy for wind, it has some features that will keep it in place – six metal ground stakes and sand pockets for both panels and a big wind vent. It’s very cheap and portable, so it’s an ideal choice for your little ones. This next product is a very interesting concept – a beach umbrella with anchor points and windows that acts as a wind resistant beach canopy. The design is beautiful and innovative and offers protection for most types of weather. It can fit up to two adults, with plenty of room for your personal belongings. It’s very, very easy to set up and it’s wind resistant, water resistant and offers UPF 50+ sun protection. The only real problem it has is the fact that it can’t be used in stronger winds, like any other umbrella, although it has 8 steel ground stakes and 3 tie-down cords to make it a bit more resistant. Price-wise, we’d label it as “mid-range”, although it might not bring a lot of value. The last product that we’re going to review is the Easthills popup beach canopy. Closer to premium quality, the Easthills Easy Up Beach Tent offers plenty of features to make your day at the beach a big success. To start, it’s very roomy – 82″ W x 47″ D x 50″ H. It can hold two adults and children or pets with no issue. You can even fit two beach chairs inside and still have plenty of room for your luggage. 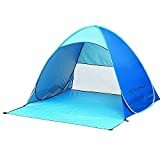 This beach cabana tent also comes with three mesh windows, for great airflow, a 43″ porch, four internal pockets and velcro sandbags for more stability. It’s not too expensive, although when compared to most of the other tents, it does seem to be in the top 3, but it’s worth every penny – trust us. We’ve done extensive research on weather and sun shelter beach products to ensure that we’re only going to present high-quality products. While it’s clear that each of them is better in certain scenarios, it’s important to keep in mind that all of them are made using quality materials and will offer you proper shelter, provided that you follow our advice.